Here, we look at what different coalitions could mean for Italy’s position in the development landscape, with a particular attention to migration and security issues. A coalition of the populist Five Star movement with social democratic Partito Democratico offers the most support for development—with potential progress on aid and security, and the opportunity to maintain Italy’s leadership in the G7 on finance and environment. On Sunday, Italian voters were called to the ballots to elect a new parliament and were left with a hung parliament, with populist Five Star Movement as the single biggest force but too weak to govern alone. 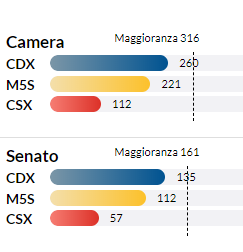 Former PM Berlusconi’s right-wing alliance won most seats, but not enough for a parliamentary majority, leaving the incumbent left wing Partito Democratico (PD) clearly defeated. Given that no winner emerged from the elections, it could take weeks until a new coalition government is formed. The run-up to the election was marked by a large share of voters remaining indecisive until the last minute and the “Macerata” incident where a right wing radical shot and wounded several African migrants. This led to emotional and unscrupulous campaigning on most sides of the political spectrum. Even before this attack, it was widely assumed that migration would be the key issue affecting voters’ decisions and the outcome of the elections, given Italy has accepted a large number of migrants arriving via the Mediterranean route, which has also shaped the negative perception of migration in Italy. Italy has faced major economic challenges with income per head still below 2007 levels, and substantial challenges from inward migration. The economic situation and the elevated levels of poverty were also widely debated, leaving many voters with their backs turned on the ruling social democratic PD—its disastrous outcome in line with many other European social democratic parties. Each of Italy’s possible coalition governments would shape the development agenda differently. But what can they build on? Italy is often considered as a laggard in development policy compared to other G7 and big European economies, which is not entirely confirmed by our Commitment to Development Index (CDI). Italy ranks in the middle field—14th in the 2017 edition. It outperforms all other G7 nations on the finance and environment components and scores slightly above average on migration and trade. Still, Italy lags behind on technology and has room for improvement on aid and security. However, since the last elections, a lot of progress has been observed. After the ruling Partito Democratico put in place its new development strategy in 2014 and established the development agency AICS, Italy’s score has improved in four of the seven policy fields assessed in the CDI. However, the Italian voters’ call for change will affect if and how this path will be continued. Below, I discuss each of the most likely coalitions and look into consequences for Italy’s development policies in the framework of the CDI’s indicators and based on the parties’ programs and campaigning. The anti-system coalition of the Five Star Movement and the League would do little for international development, given its regressive approach to migration. Although the League’s leader Matteo Salvini ruled out a possible coalition with the Five Star Movement and reassured his commitment to the right-wing alliance with Berlusconi’s Forza Italia, this coalition remains an option—at least arithmetically. This coalition would be formed based on their common resentment of the EU and—linked to the public’s perceived failure of the common European asylum policy—to their demand of a more restrictive immigration policy. However, although both the League and the Five Star Movement emphasize more national autonomy and Italy’s sovereignty in their programs, the two parties have a fundamentally different understanding of many issues affecting developing countries. While both parties underline national security, the M5S states support for the principle of non-proliferation and the Charter of the United Nations whereas the League commits to peacekeeping missions in national interest. For instance, the two parties would favour a different approach to international arms sales. Given explicit reference to the national arms industry in the League’s program, we would expect arms exports to poor and undemocratic countries to increase, whereas the M5S wants to prohibit all arms sales to countries in conflict. In terms of migration policy, the League pursues strict anti-immigration policies like other European right-wing parties such as France’s Front National or Germany’s AfD. Their proposed solution to the migration inflow to Italy consists of deterrence at the border, increased cooperation with other isolationist European countries (e.g., the Visegrad group of central European countries), and increased repatriation of illegal migrants. They acknowledge that economic success draws migrants, as also demonstrated in the literature, but their answer is closing borders apart from selecting highly qualified migrants from culturally more similar countries (“dai Paesi culturalmente più affini”). In short, depending on the League’s power in the coalition, international mobility of workers to Italy—a powerful tool for poverty reduction and income redistribution, is expected to decrease significantly. For Italy’s role for international development, this coalition between M5S and the PD could lead to more development-friendly outcomes than other coalitions portrayed here. Both the PD as well as the Five Star Movement remain committed to the 0.7 percent target spending for aid as well as the implementation of the 2030 Agenda. Given Italy’s ODA spending is far below 0.7 percent GNI (0.28 percent GNI/ODA in 2016), the fact that both parties would want to work towards increasing the aid budget is good news for developing countries, especially if consistency with the PD’s current and successful development strategy is granted. However, increased ODA spending should go hand in hand with better aid quality such as improving its transparency. On migration: the PD would aim to remain committed to European solidarity and international legislation (Italy is one of the few countries having ratified all three conventions on migration in the CDI). It pledges to work to reform the European “Dublin”-Regulation (determining which state is responsible for an asylum application) towards a fairer distribution of asylum seekers and refugees within Europe which is—in relation to the number of asylum seekers an obvious but fair political suggestion. However, given the PD would be the coalition’s junior partner, it remains unclear how big their impact would be on migration policies, given the Five Star movement’s Eurosceptism. On security: the PD supports the EU’s proposal for the creation of a European Defence Fund, mainly to strengthen oversight in the Mediterranean as more resources for the coast guard and better border protection are specifically mentioned. They also propose a new partnership between Europe and Africa and reassure their commitment to the Migration Compact of 2016. To reduce of deaths along the Mediterranean route, the PD suggests agreements with countries of origin and transit—as does the Five Star Movement—and proposes new financing tools such as EU-Africa bonds. However, if this coalition will end up governing Italy, the PD with its experience on development policy should ensure that long term, sustainable agreements with countries of destination are put in place, ensuring the success for all involved parties including migrants. One way of enabling a preferential outcome for all stakeholders is a Global Skill Partnership, where Italy could also improve its lagging productivity. Even though the outgoing PD leader Matteo Renzi ruled out such a coalition, a minority of PD deputies are in favour of negotiations with the Five Star Movement. The right-wing bloc, formed of the League, Berlusconi’s Forza Italia, and two smaller parties, won the most seats but missed a majority to govern. If the alliance succeeds in involving other parties or in governing with their consent, Italian development policies could see a major shift towards more isolationist, repressive migration policies. Forza Italia’s disappointing result—given that it was widely assumed to emerge as the senior party in the right wing alliance—has promised its voters to seek to deport many of the around 600,000 undocumented migrants. Given that the League and the other two minor parties of the right-wing bloc are openly anti-immigrant, we can expect the largest shift to restrictive migration policies from this coalition. As most likely leader of this coalition, the impact of the League on Italy’s security policy would be significant. This would mean a shift towards closer cooperation with Russia, more targeted, military interventions under the umbrella of counterterrorism operations and peacekeeping missions in countries of strategic interest only. Italy is currently the fourth biggest financial contributor to UN Peacekeeping missions of all 27 OECD countries evaluated in the CDI. Given the financial pressure UN Peacekeeping missions face already, a League-led Italian coalition could have lasting consequences for the world’s poorest. As we have seen in the case of Germany, long weeks of negotiations lay ahead. A key role will be assigned to President Mattarella to establish options for viable coalitions. If no party or alliance is successful, new elections must be called. Overall, the options presented here do not appear very promising for Italy’s current successful development agenda. As we have seen, a future government made up of M5S and PD could lead to the most development-friendly policies. The PD’s experience with its successful development strategy and the broad voter base of the M5S combined might even lead to wide-ranging support for aid and the international security regime. Given the prominent role of migration policies during the campaign and the fact that the inflow of migrants via the Mediterranean route can’t be regulated by Italy alone, this could mean that international cooperation, especially on migration and security issues, will find its way on the Italian agenda for the next few years—for whichever government emerges from the weeks of negotiations. This would be in the best interest of Italy, Europe, and developing countries.